SPHINX (Space Plasma High-Voltage Interaction Experiment) was a self-contained satellite which was designed to obtain engineering data necessary to design high-voltage systems that could be exposed directly to a space environment. For this project, a single satellite launch was planned. During ascent, the Sphinx spacecraft was to be supported on top of the Viking Dynamic Simulator (VDS), the prime payload for this flight. The Sphinx satellite was to be ejected from the VDS at a velocity greater than two feet per sec and at a spin rate of approximately 30 rpm. The satellite would have been positioned initially so that the spin vector was toward the sun. The release of the sphinx was to be after the third burn of the Centaur, and was controlled by the Centaur event timer. performing long-duration studies on the electrical breakdown of and the stability of imperfections in insulating materials. The spacecraft failed to achieve orbit following launch due to Centaur upper stage malfunction. 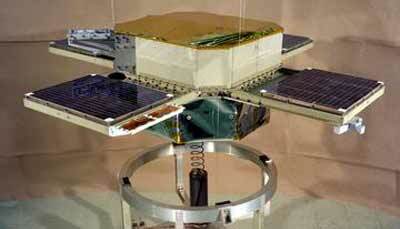 Two more satellites called SPHINX B and C were to be launched in the early 80ies. They would have been launched either individually as a piggy back payload on a Shuttle IUS mission or together on a dedicated Delta launcher with an apogee kick motor. Both satellites were cancelled. SPHINX B - cancelled CC Shuttle [IUS] (baselined) with ? SPHINX C - cancelled CC Shuttle [IUS] (baselined) with ?